It's supposed to be 9 degrees overnight. Our sow had piglets. Tonight. 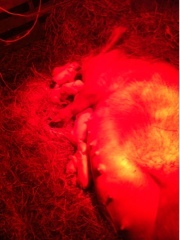 Under a full moon she gave birth to 12 piglets. Homer noticed earlier today that the sow was exhibiting signs of imminent birth. There was already a shelter and a nest, which he reinforced in a number of ways. When we visited the farm show a couple of weeks ago we noticed piles of sheep shearings...wool. When we asked about it we were told it would be thrown away, that we were welcome to take it. That went at the bottom of her nest, as insulation against the freezing ground. Then a couple of bales of hay. She gave birth on the coldest night of the year. The low temperature is 13 tonight. More needed to be done. Sides went up and heat lights went on. With that it is about 70 degrees in their enclosure. Homer assisted the birth, dried off each piglet, helped them find the teats. Very quickly each piglet started moving around, squealing, getting into a pile of pigs. Amazing. Not a flattering photo of the momma pig but here they are.